The University of Missouri protests led by Black students that prompted the resignations of System President Tim Wolfe and Chancellor R. Bowen Loftin in last November had ripple effects across the nation. In solidarity with their counterparts in Missouri, Black students across the nation held protests of their own highlighting diversity and inclusion shortcomings on their respective campuses, including institutions such as Ithaca College and Yale University and, in the Pacific Northwest, the University of Oregon (UO). 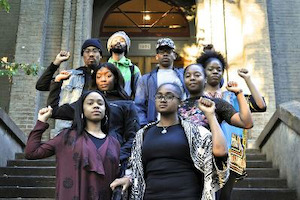 The University of Oregon (UO) Black Student Task Force, from bottom left to right, by row: Denisa Clayton and Ashley Campbell, Shaniece Curry and Alexis White, Diamante Jamison and Dayja Curry, and Kena Gomalo and Jaleel Reed. On November 12, 2015, the Black Student Task Force (BSTF) held a protest on the campus of UO, expressing the view that the inclusion struggles of their counterparts at Mizzou mirror their own struggles at Oregon’s public flagship institution. The BSTF met with new UO President Michael Schill and other campus administrators that day to highlight the marginalization and racism they said they felt on a persistent basis at UO. On November 17, the Black Student Task Force issued to UO administrators a list of 12 demands they said would redress pervasive discrimination against Black students on UO’s campus. In response to the BSTF list of demands, OU administrators created 13 working groups to address each of the 12 student demands point by point, with an additional working group on African-American student advising and retention. BSTF Demand No. 2 pertains to the creation of an African-American Opportunities program led by Black-identifying individuals to boost Black student enrollment specifically, similar to an existing Opportunities program for the Latino student body and community. Some point out that UO’s Black student population mirrors the low Black population across the state, as the Black population in Oregon is 2.1 percent according to 2015 census statistics. Notably, a constitutional ban against Blacks settling in Oregon was not repealed until the 1920s, according to an article posted to the City of Portland’s Bureau of Planning and Sustainability’s website. Yet BSTF member and graduate law student Kena Gomalo says half of UO’s Black students are from California and UO could do more to recruit Black students from Oregon. “For African-Americans specifically, we’re endangered species on this campus. We’re going extinct,” says Gomalo, who hails from North Portland. “You go back to my neighborhood; I’ve never seen the University of Oregon in my neighborhood, ever. In April, Schill and Dr. Yvette Alex-Assensoh, UO’s vice president for equity and inclusion, outlined six responses to the BSTF’s demands, indicating more will be done to address the demands. Schill harkens back to his student days at Princeton in reflecting on what it’s like to be the “other” on campus. As a native of New York City, Schill says he had not heard of wealthy enclaves such as Greenwich, Connecticut, and others his classmates hailed from. Certainly the lack of Black faculty is a major concern of the BSTF, as Demand No. 6 calls for the hiring of an African-American adviser and retention specialist as well as Black faculty across all academic disciplines. Though he is not a member of the BSTF, Michael Tani-Eshon — a recent UO MBA graduate hailing from Ghana — says boosting the number of Black faculty at UO will benefit all students. “One of the things that I see as challenging, even with my cohorts, is that the reason why they have a problem respecting a person of color is because they’ve never been taught by a person of color,” Tani-Eshon says. “So making that deliberate effort, especially in those faculties and departments where there is none, is important. Dr. Doug Blandy, UO’s senior vice provost for academic affairs, says UO has been changing faculty search and hiring practices to foster more diversity. Blandy says cultivating a pool of diverse faculty candidates can start by inviting a recently graduated minority Ph.D. to campus to deliver a talk so they can become familiar with UO. Providing funds for faculty to travel to conferences to recruit diverse faculty prospects is another way UO can make progress in the area of faculty diversity. According to the UO Office of the Provost and Academic Affairs, progress is being made on the diversity front when it comes to new faculty hires for this fall. Of 49 new faculty hires for this fall, 23 are women and 14 are faculty of color. However, citing Oregon public records law, a UO spokesman declined to specify how many of the 14 faculty of color hires are African-American. One of the thorniest issues on UO’s campus is the hostile climate many minority UO students say they face. BSTF Demand No. 1 calls for the renaming of buildings named after individuals associated with the Ku Klux Klan. Lauren Witherspoon, a Black UO educational leadership doctoral student, says she is afraid to walk on campus after sunset for fear of Ku Klux Klan activity. “I went to a hiking spot and didn’t know that KKK used to have their cross and burn it at the top and the whole town could see,” Witherspoon says. UO student Gerald Jakabosky, co-director of UO’s Asian Pacific American Student Union, says union members have reported to him racial slurs against Asians being shouted from UO fraternity balconies to Asian students. “And these will be people who are just walking home at night,” he says. “ … That’s kind of like the environment that we face just being here on campus.” Schill says he is personally vested in tackling such issues. “We are very, very committed because I understand what it feels like to not feel necessarily at home in an institution. And what we want is … students to be able to do their best here. And the way they do their best is they need to have cleared out from their head worries about feeling like they don’t belong,” Schill says. Schill and Alex-Assensoh have announced that, in response to Demand No. 11 concerning the welcoming of Black Greek letter organizations on campus, beginning this fall six Black Greek organizations will be invited to become part of UO Fraternity and Sorority Life. With regard to Demand No. 9, which calls for inviting Black faculty versed in Black history and contemporary Black issues to UO to conduct seminars and workshops, Schill and Alex-Assensoh also announced that the African-American Presidential Lecture Series will bring noted Black scholars to campus. BSTF Demand No. 12 calls for a commitment to collecting and publishing data on UO’s efforts to increase Black student acceptance rates, retention and safety. In their response, UO will now publish campus diversity data online. BSTF Demand No. 5 called for the creation of an Academic Residential Community that will feature Black history. In their April response, Schill and Alex-Assensoh announced that the Umoja Pan-African Scholars Academic Residential Community will be launched this fall and will accommodate 25 students. “Ed decided he was going to commit $500,000 as startup money for each of these buildings which cost close to $2 million a piece. To me, that’s a serious commitment,” Davis-White Eyes says. Alex-Assensoh says simply working to create safe spaces for Black students is not enough, as campus climate issues should be tackled holistically.